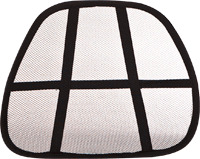 Lumbar mesh support encourages proper posture while sitting. It can easily be transferred from your home, work, or automobile. 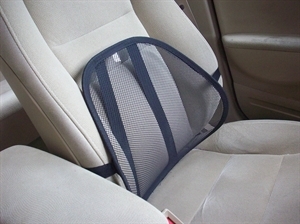 This is the lightweight version of the contoured, bucket seat lumbar support. The nylon, mesh material keeps the product cool and comfortable for you to use all day in any seated environment. It contains a strap to secure the cushion to your seated surface. Lumbar mesh support is black.